Stick to the essentials. Get rid of everything else. 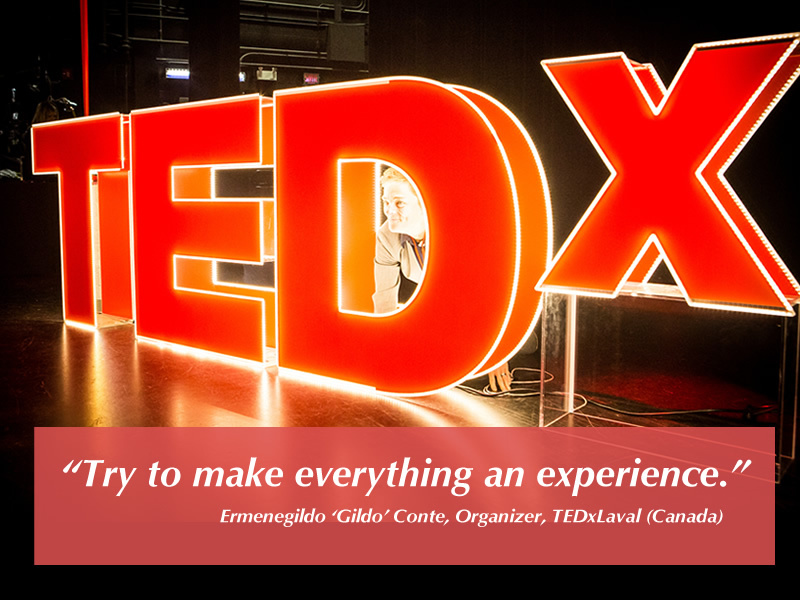 Gildo Conte is the Organizer of TEDxLaval, located on an island next to Montreal, in Quebec, Canada. His passion and energy are infectious, and I bet it's great fun being a part of his small, five-person team. His first brush with TED was when his kids said, "Dad, do you know about TED?" He says that it was a magical moment for him. He's purposely kept the event small, 150-250 people with nine speakers in an evening event. I love that he serves cocktails before the show. His biggest surprise was that the reach of the event in just two years has been remarkable. Gildo says that there has been a good reaction from outside the region. His biggest challenge is that the French community of Laval doesn't know about TED or TEDx. We've heard this often from other Organizers, and it doesn't appear to be isolated to any given region. As much as we think everyone's heard about TED, the reality, is they've not. In 2018 they've managed to produce four Salons, plus a Youth event. Remember, this is with a team of 5. That's impressive. The video, just below, is the original promo that Gildo mentions in the episode. They’ve done three main events and 4 Salons in 2018, including a Youth event. They have a small show on purpose, less than 250 people, with nine speakers in an evening event. Unique: serving cocktails before the show starts. Curating. He says that they have a very good coaching process and have coaches come in from outside the TEDx world to help. The reach of the event in just two years. The French community doesn’t know about TED. There’s no prominent University, and it’s a challenge to reach out into the Community. The Talks. Knowing how hard everyone works makes it enjoyable to see them come to life. Try to make everything an experience. See if you can get a sponsor to fund an experience.